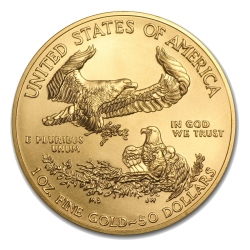 Produced by the US Mint, the American Eagle gold bullion coins are backed by the US government and manufactured to the highest levels of quality and security. Containing 22 karat gold, the American Eagle in Gold is a sturdy investment for any portfolio. The coins are produced from gold mined in the United States and are available in four denominations, namely 1/10, 1/4, 1/2 and one ounce. The smaller weights are struck to make the coins more accessible to every day investors and make thoughtful gifts treasured by the receiver. American Eagle coins are backed by the US government as legal tender and are recognised as precious bullion on the world market. American Eagle gold coins are available for purchase from the CoinInvest website and are available in different weights, sizes and years. Feel free to browse through our handsome collection and select the coin of your choice by clicking in the images above. You can learn more about the individual coins and purchase them by clicking on the green band to add them to your basket. Please note that the value recorded on the coins is US dollars (USD) is not the actual value of the American Eagle coins – they are worth a lot more in today’s economic climate. The true value of the coins can be worked out by the current spot prices that are tuned on a daily basis by the stock market plus a small premium payable to CoinInvest. The weight denoted in "oz" represents "one troy ounce" and weighs exactly 31.1034768 grams. The first gold coin produced in America was the $10 gold "Eagle" in 1795. More than two hundred years later, the US Mint continues to manufacture meticulously designed coins that represent the strength and stability the country stands for. The modern era of the American Eagle Gold Bullion Coins were first minted in 1986 after being authorised under the Bullion Act of 1985. The coins did not take long to become a popular favourite amongst investors and collectors and they continue to be a leading gold bullion in the current financial climate. A durable product, the bullion coins are made from 22 karat gold plus small amounts of metal alloy. This makes the coins more resistible to scratches and marring which would otherwise cause the value of the coins to diminish upon resale. The coins stately appearance and symbol of pride has made American Eagles one of the world’s most purchased coins since its inauguration. In 2006, the United States Mint added another member to the American Eagle’s precious metal family with the introduction of the uncirculated silver anniversary coin to mark the coins 20th year of production. The design of the American Eagle coin is heavy in symbolism and signifies what the country of the United States represents to the rest of the world. Other than the words depicting the nation of origin, the statue of Liberty and the 50 stars that represent the countries states are also present. On the obverse side is Liberty, perhaps the most famous symbol of the United States after the flag and the dollar bill. The design was created by Augustus Saint-Gaudens in 1907 and first appeared on the $20 coin or ‘double eagle’ as it was also known. Other editions of the bullion coin have featured renditions of Adolph a Weinman’s remarkable Walking Liberty design which was originally prepared in 1916 for the nation’s half-dollar coin. Also on the obverse side is the year of issue. The reverse of the American Gold Eagle coin features Miley Busiek’s depiction of two eagles building a nest which signifies the strength and security of the nation to allow American families to build their own nests. The male eagle carries an olive branch in its beak representing peace whilst the female bird protects her fledglings in the nest. Also featured is the Latin expression E Pluribus Unum which is a motto of Congress meaning “one out of many.” To the right of the nest are the familiar words “IN GOD WE TRUST.” The weight and denomination of the coins is also found on the reverse side. The United States Mint produces proof and uncirculated versions of American Eagle coins. The minting process begins by manually feeding blank coins into presses fitted with special dies which are struck multiple times so the softly frosted, yet detailed images seem to float above a mirror-like field. The blanks are punched from coiled strips of metal about 13 inches by 1,500 feet which is then heated in a furnace to soften them. They are then washed and dried before going to the upsetting mill to create a rim around the edges. Finally the coins are stamped with the design in a coining press. For the financial protection and security of dealers and investors, the American Eagle coins undergo strict quality assurance measures. White-gloved inspectors check the coins to ensure they are in perfect condition before sealing them in a protective plastic seal and mounting them in a satin-lined velvet presentation box. American Eagle coins are only ever issued by the US Mint. The weight and purity of American Eagle gold coins are backed by the US Government which makes them easier to sell anywhere in the world. As one of the most popular coins on the market they are recognised internationally and the most widely traded bullion coins in America. If you want to sell American Eagle coins, feel free to contact a friendly member of our customer services team. We guarantees a fair market price based on the current spot price.